Our Yoga instructor Kira Staggs showing her flexibility and strength. All the things you've come to associate with personal wellness, such as yoga, meditation and mindfulness. Focusing on ways you can work to reframe your experiences and manage your day-to-day stress. We can reduce and manage stress at work with relaxation techniques, and we can learn to be mindful in our interactions with others. But alone it's not enough. Larry DeLuca, Sherri Tomerczaak, and Lisa Chan. Photo by Kevin Reilly, MD. Workplace wellness requires not just the health of the individuals, but also the workplace itself, and the larger systems that govern it. No matter how resilient or centered the individual is, they won't be happy in a workplace that's not healthy. What is it like to be at Happy Doc Summer Camp? With all that summer camp as a kid was to you! That means cabin-style housing, food in the dining hall - and s'mores by the fire. The accommodations are not luxurious, but comfortable and homey. Double-occupancy, quad-occupancy, large-group, and family cabin options are available. A typical cabin sleeps several people. Bath/shower in rear of cabin. A relaxed moment in one of the two dining halls between workshops. S'mores or storytelling by the campfire is always popular. A typical row of cabins. There are about 80 cabins, and the camp holds up to 800 people. The camp has 370 acres of land, with Lake Akiba in the center. It provides plenty of space for all sorts of activities, and is nestled in the Pocono Mountains of Pennsylvania. Lake Akiba is at the center of the camp, and can be used for kayaking and pedal boating. And while there's plenty of activity, there's quiet places to reflect and meditate as well. So who's talking about all this stuff? Kelly Barringer and Kristi Grall at CORD Academic Assembly 2018. Kristi Grall and Larry DeLuca at SAEM IGNITE! 2018.
are frequent national and international presenters. 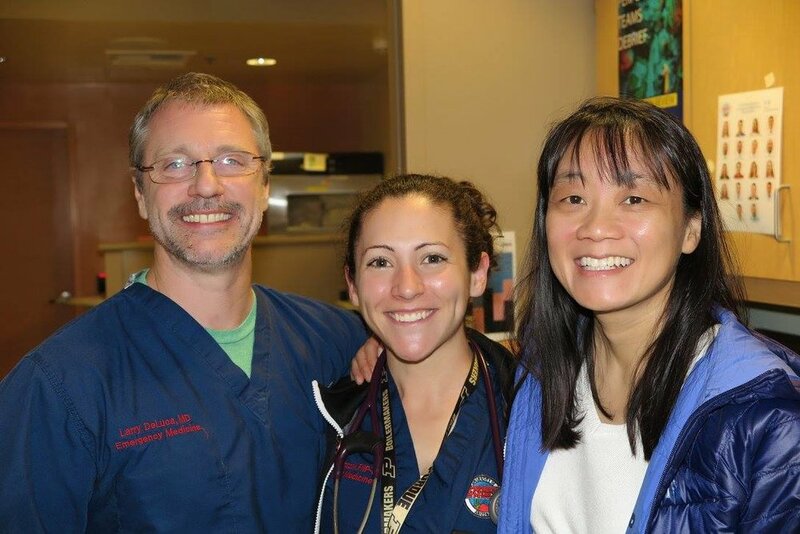 They most recently won an award at the Society for Academic Emergency Medicine's 2018 IGNITE! Competition - for Happy Doc Summer Camp! There will a combination of lectures, small-group programs, panel discussion, and facilitated workshops. You can meet the rest of the faculty by clicking here. You can find a course listing here. And you can see the full event calendar by going to our EventMobi site. Robert Lam speaks on Second Victim Syndrome at AAEM Scientific Assembly 2018. Ourdoor activities include boating, swimming, ziplining, a ropes course, climbing wall. There's tennis, basketball, and volleyball courts, a driving range, and a full gym with cardio and weight equipment. There's even an inflatable obstacle course. Your registration fee includes all CME, workshops, activities, food, beverages, and transportation to and from Newark airport. Prices go up after January 1! Join us August 26-29, 2019! You'll be glad you did! Register 5 or more and the 6th is free!